Trip Summary . . . I learned several new things, but the biggest thing I learned, I need to get out more! I am so inspired after talking with other quilters and seeing so many wonderful projects in the quilt shops, at Carrie's trunk show, and quilts made by my classmates. Carrie was just wonderful, a bundle of energy and nothing but fun! She made me feel welcome right from the start. 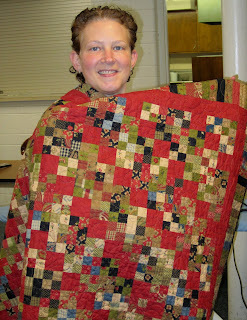 The thing that I found most interesting about Carrie, she's a quilter, just like you and I. 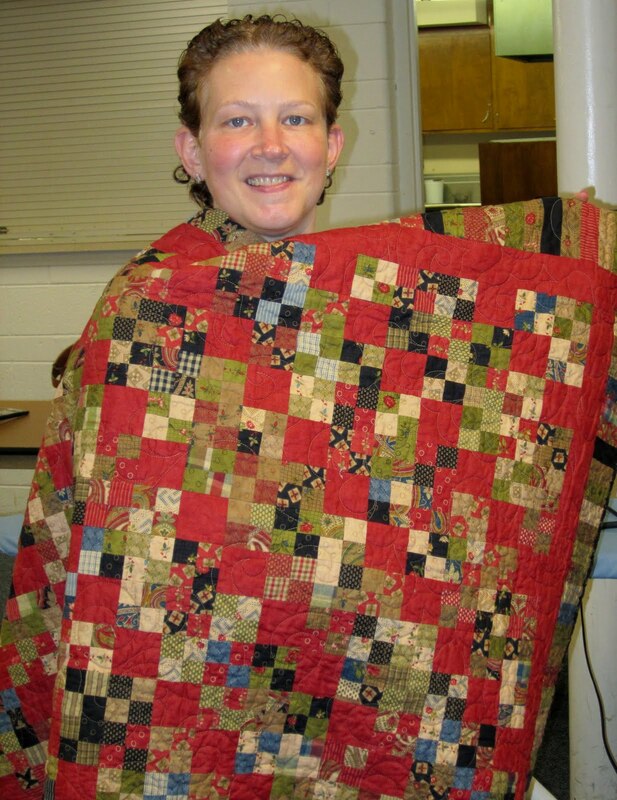 Sure's she a creative and fabulous pattern designer, but she likes to buy fabric, make quilts by other pattern designers, participate in swaps, and talk about the latest fads, just like we do! I also met up with two fellow bloggers on my trip. Nicole, from Sisters Choice, on the left, and Lisa, the Stashmaster, on the right. This was my first experience meeting someone face to face, that I previously only knew from their blogs. I was thrilled to get to know them better. Not only are Lisa and Nicole popular bloggers ( everywhere we went, folks recognized them from their blogs) they are quilting rock stars. I can't imagine what it would be like to walk into a quilt shop, and see a quilt you made on the cover of a pattern, I think I was more excited than Nicole!! More details to come, I was really dragging yesterday. At first I thought it was the hectic pace of the trip, but it was probably that I didn't stop by Starbucks yesterday for my shot of sugar and caffeine! 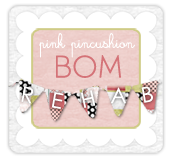 I can hardly wait to show you my class projects, I love them all! All my bags are packed . . . . .
My bags ARE packed and I AM ready to go, not on jet plane, in my car....but I'm happy about it!!! You see, I'm not a class person, which makes this news seem a little silly, I'm heading north to take not one, not two, but THREE classes with Carrie Nelson of Miss Rosie's Quilt Company!! Here's what I don't like about classes, the chairs that are too short, the tables that are too crowded, the ladies with too much perfume, the pathetic excuse for irons, having to pack everything up before class, then unpacking everything when you get home. It just seems like a lot of trouble, so I tend to stay home....by myself, like a hermit!! Well I figured I needed to blow some stink off too, and crawl out of my cave, meet some new folks, and be open minded to maybe having some fun.....I tend to be a little too serious for my own good. On Saturday, The Quilters General Store in Rockford is hosting Carrie and we'll get started on this beauty...Route 44! 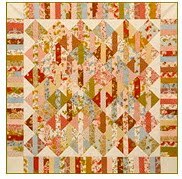 I've decided to use Saltbox Harvest by Deb Strain for Moda for my project. I'm thrilled because, if you read my blog regularly, you know I've developed a thing for dots, and that family has the some great dot prints. My primary fabric will be the multicolored dot with the red background...me and my red couch are very excited about it. On Sunday I trek over to St. Charles, where the Prairie Star Quilters Guild is sponsoring two Carrie classes. You know me and Schnibbles, I'm always changing them up, but I'm going to try real hard to be a good student and make this quilt as written. I'm going with some light and bright cupcake and daisy fabric and hope it all comes together for a little wall hanging for my sewing room. Then, on Monday, we start this, Ashcombe! I've been saving some Simple Abundance by Bonnie and Camille for Moda for a special project, I think this is it! I'm going to go heavy on the reds from that family to make my other red couch happy. So in addition to these classes, I'm going to meet some quilters for the first time that I feel like I've known forever, hit some new quilt shops, and hopefully find a good cupcake or two! I'll miss ya while I'm gone, but hope to have some great pictures and stories to share when I get home. It's beginning to look a little like Christmas . . . . 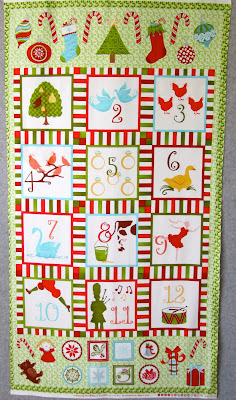 Sometime earlier this summer, the Fat Quarter Shop started "jollily jabbering " about their 2010 Designer Mystery Block of the Month program using Kate Spain's Twelve Days of Christmas collection. I was a little intrigued, looked the fabric collection over, and gave it some thought. Two things stopped me from signing right up. Second, the blue in the Kate Spain fabric collection did not appeal to me, at all. I'm funny with my blues, I generally like blue, but not light blues so much. So June rolled around and bloggers started posting pictures of the June block. I thought it was cute, but it was no surprise, it was the block that the Fat Quarter Shop had on its site for the program. And it had a big chunk of that blue fabric right in the middle, I wasn't even tempted, even though the block was very cleverly designed. 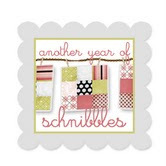 So for July, another block and more posts by those Type A quilters who sign up for a block of the month, and then, actually make the block....that month!! It was an adorable Santa hat designed by Bonnie and Camille, another clever pattern, some blue, but not overly blue. So I decided to live on the wild side and signed up. I figured even if the remaining 9 blocks were a bust, which I seriously doubted, the first three alone could make a really cute quilt. designed by Gudrun Eria of GE Designs. So here are the first three blocks....all done and I think looking pretty good, even with no blue. If you would like to know what the original blocks look like in comparison to mine, check out Sherri's blog, at A Quilting Life, she posted a picture of the first 4 blocks on her blog yesterday. This family of fabric also has an adorable panel that I plan to incorporate into the backing for this quilt. It's not too late to sign up for this BOM, you too could throw caution to the wind, accept that maybe surprises aren't all bad, and make any changes you want as you go! Quilt Number 60 . . . . . .
Lee's Quilt is all done and at the quilter's. The center of this quilt could not have gone together any easier. 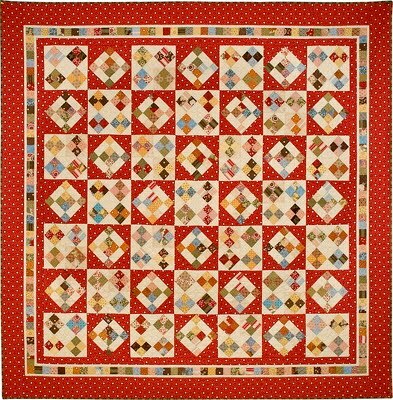 When you need a quick quilt, I totally recommend this pattern. I was really liking the Wagon Wheel pattern, but as Dianne mentioned, this is just one big wagon wheel. but I decided to jazz it up a bit with some strips instead. This quilt finished at 58" X 64" and is my lifetime quilt number 60! 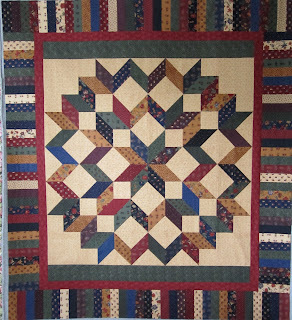 When I started this project, I was torn between the Simple Stars Beautiful Quilt pattern and the Wagon Wheels pattern. Now that Lee's quilt is done, I have to say I'm really pleased with the look and think it really suits my father-in-law, so I think I made a good choice. That was until I got this..... Buggy Wheels!! Sandy sent me this pattern, it's from the April 2005 issue of the American Patchwork and Quilting magazine. I just love the little extra something going on in the corners of that sashing! Maybe I'll just make both!! Decision, decisions . . . .
Butterfly Garden by Kansas Troubles Quilters . . . 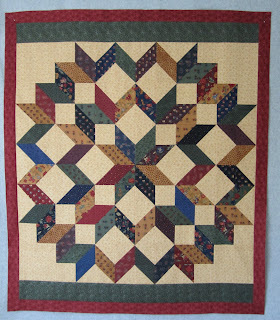 Simple Stars Beautiful Quilts by Debbie Maddy. This pattern uses half squares triangles to make this design. All you have to do is assign each fabric a number, one through 8, then lay out the hsts according to the "layout diagram" provided in the book. Butterfly Garden has 7 different colors, beige, gold, blue, maroon, black, green, and purple. So right off the bat, I eliminated the gold, and knew the beige would be my background. That left me these five fabrics to work with. The first thought that came into my mind was to just load up on the blues. What guy doesn't love blue. But the blues were so close in value to the black I didn't think that would make the design pop like it should. not only did I put the gold back in the mix, I doubled it and the green. In this case, it's not the colors that were important to me, but the values of the colors. So here are my eight fabrics, one through eight; blue, green, purple, gold, black, green, maroon, and gold. That was the hard part, picking the right combination, all that's left is the sewing. 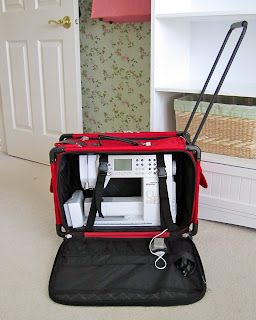 I hope you're having a great week in your sewing room! Ah Fall . . . . I'm always a little sad to pack up the summer things, but I love fall, and I can't stop time, so I say goodbye to my summer favorites and welcome the things I love about fall. One of which is pumpkin! One of the great things about fall is that Starbucks introduces, for a limited time only, pumpkin scones and pumpkin cream cheese muffins. They are Yuuuummy! So over the weekend, after completing my fall "chores" I decided to reward myself with a Starbucks pumpkin treat. For some reason, before I left for Starbucks, I decided to check the nutritional value of these fall bakery items. (sometimes the internet is not your friend, and ignorance really is bliss!) Each item was close to 500 calories, yikes! And in all fairness to Starbucks, the items are huge, really more like 2 servings, but I knew myself well enough to know, I wouldn't eat just half a muffin or half a scone, so I decided to bake some pumpkin bread instead. I researched some lower calorie recipes online, made my list of required ingredients, then headed to the grocery store. 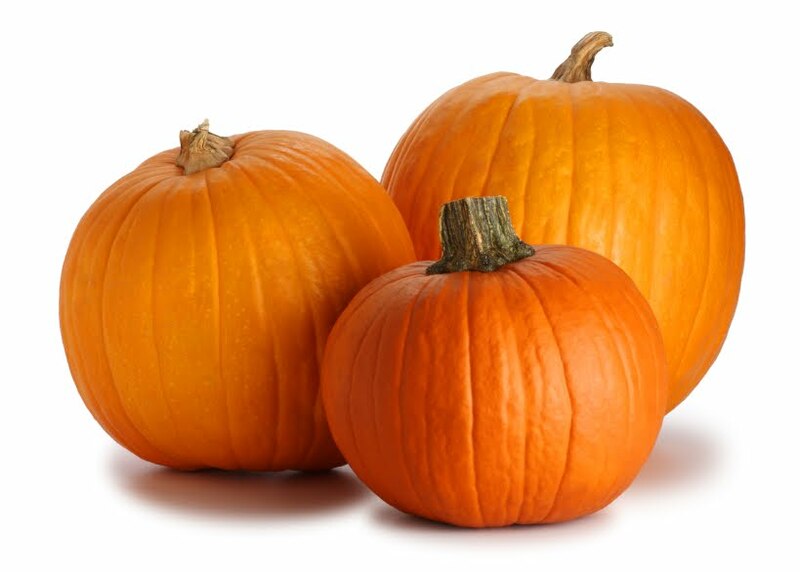 Have you tried to buy canned pumpkin lately? I guess the stores have been out for months!!! I guess last fall's crop didn't produce much. I went to 3 different stores, no pumpkin. One person even told me they weren't sure they would be getting pumpkin by Thanksgiving!! I was shocked, how did I miss this, I watch the news, I read the paper, how did I miss out on the pumpkin shortage.....and where's Starbucks getting their pumpkin for their bakery items?? Luckily I have a girlfriend with a kitchen pantry much like my sewing room closet, stuffed! She had 3 cans of pumpkin and gave me one. I made the most delicious bread, we enjoyed every slice, like there was no tomorrow, good thing, 'cause there is no tomorrow when it comes to pumpkin. I think I'm going to have to find a Starbucks buddy who is willing to share one of their pumpkin treats with me. One, who when I say, " I think I want my own pumpkin muffin/scone" will say, "No Thelma, you only need a half of one". I bet you're wondering how I'm doing on my Lee's Quilt (my father-in-law's quilt)! I've made a pattern decision!! Now that's what I call progress! Wagon Wheels is 56 x 74. The blocks finish at 16 inches, so I could leave off the last row of blocks and have a nice size quilt. The only downside, each block has over 70 pieces..several half square triangles, and some of those blocks with the triangles on the corners. This one is 70 X 70, not really a lap size. The blocks that make this design are 6 inches finished. 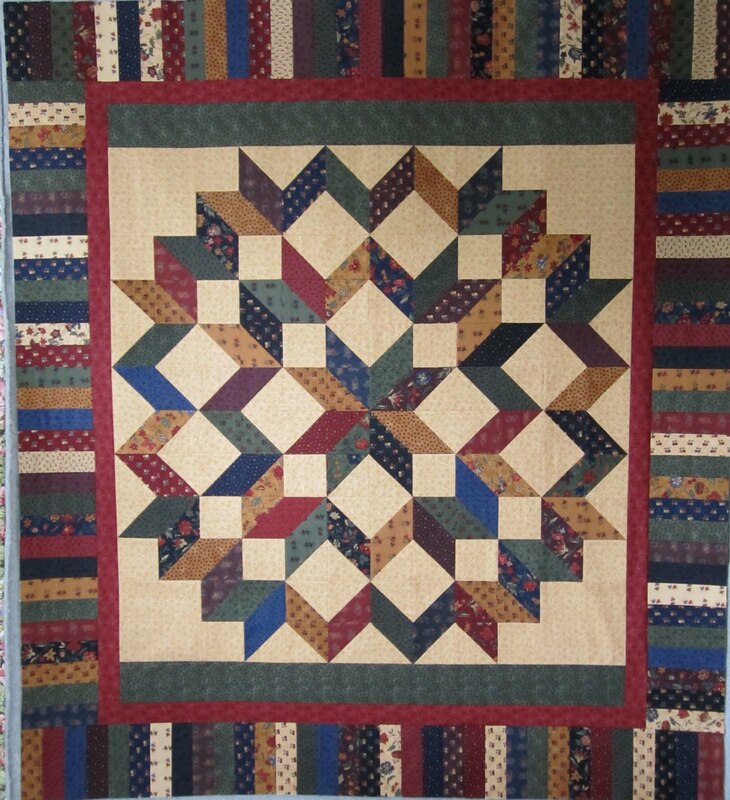 I decided to halve the block size of the star quilt and save the Wagon Wheel quilt for another time. 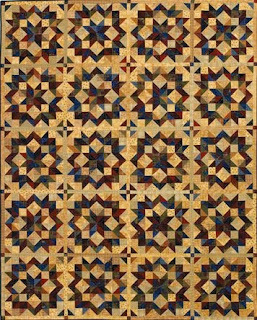 I really like the Wagon Wheel quilt and hope to make it for my husband, out of the leftovers from Lee's quilt. My husband only has one quilt, and it has a baseball theme, so a different throw would be nice for him. So that's the plan.....stay tuned for more! And be on the lookout for that pumpkin . . . .
Butterfly Garden by Kansas Troubles Quilters. I love the Kansas Troubles Quilters fabric, it just says "Welcome Home" to me. 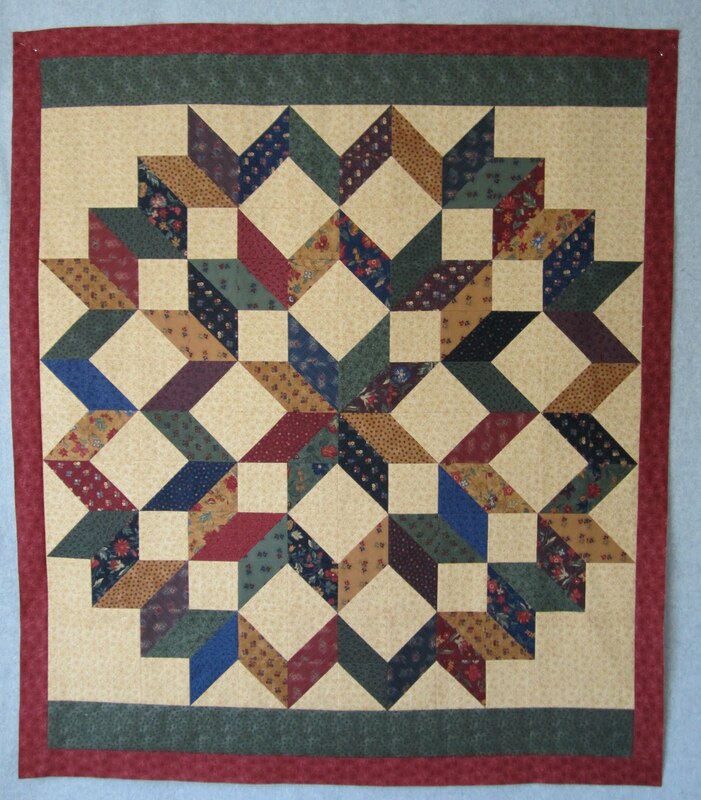 I think it is the perfect fabric when you are wanting a project with a traditional quilt feel. 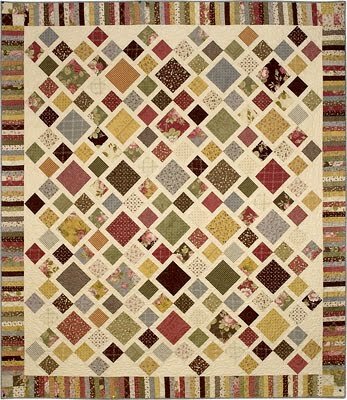 Up to this point, the only Kansas Troubles Quilters fabric I had used, was a few fat quarters in "Pat's Quilt",what I would call one of the few traditional feel quilts I've made. Kansas Troubles Quilters fabric to me also says, "fall", and "male friendly". Even though the fabric has florals, I think it would look good in the den or office of most of the men in my life. So with this in mind, I selected Butterfly Garden as the fabric for a project for my father-in-law's 90th birthday. So I bought the fabric in April, knowing I had plenty of time to pick the perfect pattern and make the perfect quilt for my perfect father-in-law. OK, so now it's September, and I've still not made this top. Not only does this top need to pieced, it needs to be quilted and bound by the middle of October. So I've had to temporarily stop production on A la Mode, which took up my whole summer, and STILL isn't done, because I've not decided what to do about my inner border problem. It really breaks my heart not to have A la Mode done, but some things just can't be rushed I guess. I have the most wonderful father-in-law, and if on his 90th birthday, I handed him a stack of fabric, and said, "one of these days, this is going to be a quilt for you! ", he would be happy. But he's always been so interested in any quilt I've made, that I know he'll be even happier on his 90th birthday when he gets an actual quilt, his first. So move over A la Mode, my father-in-law is taking over. And Wagon Wheels by This & That. Laura, from Paws 'n Tails Quilts gave me the heads up on this pattern after she saw it made up in a quilt shop using Butterfly Garden. She remembered I had bought Butterfly Garden and was looking for the perfect pattern for that fabric. Thanks again Laura! My father-in-law likes westerns, John Wayne movies and such, and I think the Wagon Wheels pattern has that sort of a feel to it. 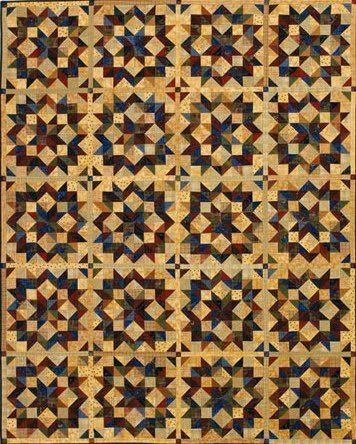 I'm looking to make a lap size quilt, so size, along with time and effort (the clock is ticking) will be the determining factors for my pattern selection. So this is my next project, or one of these is my next project, further updates to come! I've been eating cupcakes everywhere I go this summer, but have not been keeping up with the review aspect of my new hobby, today, my second cupcake review. While in Seattle, Washington on vacation (in July...where did this summer go!!) I stopped in for cupcakes at The Yellow Leaf Cupcake Company. Their tag line is "sweet, simple and sophisticated"
Right off the bat, I loved this store, look at the perfect box they have for their cupcakes, these little bakery gems were made to travel, and they did, to the top of the Space Needle and back to the hotel. Not a crumb out of place. HURRAY! When we got to the store, it was around 3 pm, the store closes at 6, and they were down to around 6 different flavors to choose from. The Pancakes and Bacon Cupcake!! Really, that's your "hot" cupcake. I hated to go to a cupcakery and not try their best cupcake, but really, a pancake batter cake, iced with maple butter cream frosting, topped with, are you ready, CANDIED BACON BITS!! I was really torn, the cupcake just did not sound appealing to me, what's a "professional" cupcake reviewer to do? 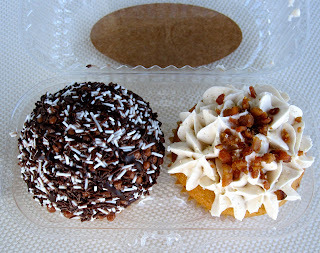 I hemmed and hawed until my husband finally said, "I'll get the Pancakes and Bacon cupcake, you can get what you want"! Woo Hoo, I knew I took him on vacation for a reason! White cake with chocolate Italian buttercream icing, the Ultimate Chocolate. I took one bite of my husband's Pancake and Bacon cupcake and did not care for it, so I'm just going to review the cupcake I chose for myself. So the Ultimate Chocolate Cupcake earned a total of 31 points out of a possible 50. There are too many good eating establishments in Seattle to waste your time and money on these cupcakes, if you're looking for something sweet, I suggest instead, stopping by the Dahlia Bakery that's just up the street instead. 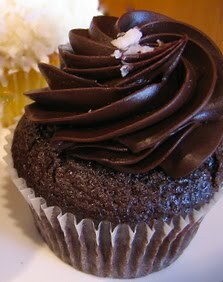 The Fleur De Sel at Kara's Cupcakes. It earned 44 points and would have earned more had it been packaged in a better box. The taste was amazing!! The Kara's Cupcake in the Yellow Leaf Container would earn a perfect score! I hope you're having as much fun reading my reviews as I am eating all the cupcakes!